Thirty years ago, Gagemaker introduced the MRP® crest diameter and ovality gage which forever changed the industry. Today, the MRP® series of gages is the industry standard worldwide. Whether you call it Crest Diameter, Root Diameter, or Ball PD, Pitch Diameter governs the strength of the actual thread assembly and ensures API dimensional measurement specs are met. The Gagemaker MRP® crest diameter gages measure the internal and external pitch diameters of tapered threaded connections. Any slight variations in diameter or ovality are immediately detected with these precision gages granting you total control over your quality. 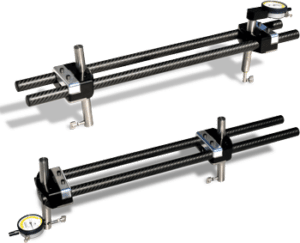 These versatile gages easily adjust to measure thread diameters ranging from 1½” – 20”. The ability to inspect a range of diameters with one gage, eliminates the need for a room full of ring or plug gages. Gagemaker - Internal/External Crest Diameter Gage, 3 3/8" reach range Internal 20" - 36", External 20" - 36"
Gagemaker - Internal/External Crest Diameter Gage, 3 3/8" reach - range Internal 8-5/8" - 24", External 8-5/8" - 24"